Winged Saint, a 100% Crabbet stallion, is currently the primary stud standing at Seren Arabians. His purchase in January 2009 was somewhat serendipitous because of the sudden death of Hanson - Seren's foundation stud - in July of 2009. 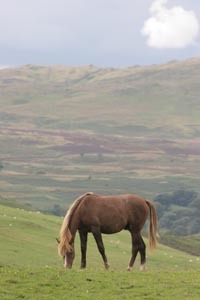 The 20-year-old stallion was bred by the Moulton Stud in 1990. By El Santo (a British National Champion) out of Silver Blue Wings (a successful show horse and sister to a dam of champions), he was inaccessible to breeders most of his life, never having been stood at stud by a stud farm. 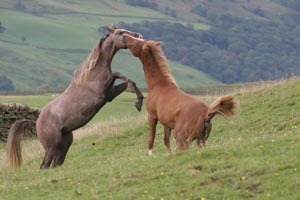 Nevertheless, among the few foals he did produce, he still managed to sire a British National Champion. 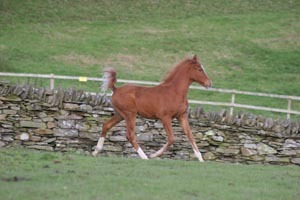 The moment he went up for sale in 2009, Jan and Dom Atkinson drove down to have a look at him. They knew right away they wanted him. "We didn't study him too closely to know he fit our criteria," says Dom. "He had an excellent temperament, conformation, movement, and he was 100% Crabbet and was a proven sire: he hadn't sired much, but he had sired (i.e. he wasn't sterile), and he had sired recently - including a National Champion, and a proven endurance daughter." Now that he is officially standing at stud, he'll have a chance to prove what many people have though him capable of - being a successful sire and carrying on the Crabbet lines. Three young colts have a paddock-with-a-view to themselves. 2-year-old Seren Hanag, 100% Crabbet, is by Hanson out of Silihah. He's a full brother to Hanos, the young stud colt that the Yosts bought last year and shipped home to Idaho. 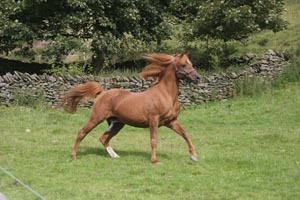 The yearling Binley Winged Spirit, by Winged Saint out of Binley Silvern Grace was bought at 6 months of age by the Atkinsons. He's 100% Crabbet. Being very keen on his sire Winged Saint, they think 'Spirit' the younger will fit right in with their breeding program. When Spirit arrived at Seren Arabians earlier this year, he slotted right into the barn with Hanos and Perdu, and Hanos' dam Silihah. 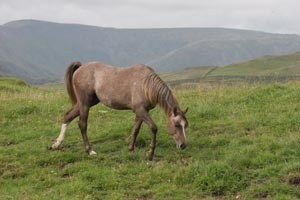 The yearling Seren Perdaius (Perdu) is the last foal from Hanson and Blue Bandaila. He's 87.5% Crabbet, 12.5% Polish. Perdu was 6 weeks old when his dam suddenly started losing weight. Within a week she had gone from being okay to desperate. She was diagnosed with lymphoma - a hopeless and very short prognosis. The Atkinsons set about to make the upcoming forced separation as least distressing as possible. They immediately set to weaning him off of his dam onto mare's milk replacer; and they separated Cally and Perdu and another mare Silihah and her foal Hanos, into their own small herd. Perdu was 10 weeks old when Cally was put down. He spent one last time curled up with his mother, and then he went off with Silihah and Hanos, and never looked back. 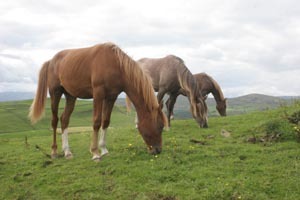 The Atkinsons successfully kept him a horse and not a pet foal, feeding by hand but keeping him in a herd situation. Perdu - French for "lost" - got his name because he would wander off from the herd then start crying for his dam. 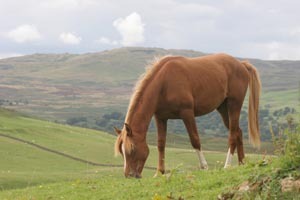 He'd go up and check out all the chestnut mares and be chased away, and Silihah would come running up, bulling her way through the herd, and rescue him and take him away with her. 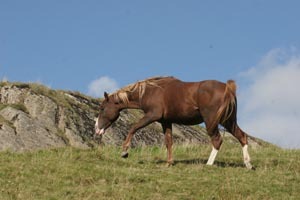 He's grown into a handsome yearling, one who hangs with his herd, but is not uncomfortable when he finds himself alone. He's a full brother to the two geldings, Seren Vega and Seren Rigel, who last month took first and second in the Wessex Group C show. In his own paddock, with a 'schoolmistress broodmare' is 2-year-old Seren Hanau, by Hanson out of Shadowed Gold. He's 100% Crabbet. He's a natural successor to Hansen because of his temperament - he's tremendously good-natured - and his size - the Atkinsons think he will reach at least 15.3 hands at maturity. Jan and Dom laugh recalling his birth: "He was big when born, very mature. Within 15 minutes of birth he was cantering around his mother - he didn't go through that lying down phase at all, he was just phenomenal!" Waiting in the wings, so to speak, is the foal Seren Winged Shadow, by Winged Saint out of Shadowed Gold. "He's a very nice boy, big, quite advanced for his age in physical and social attributes. He's got a lovely inquisitive, confident character." Dom says, "I've got a horrible feeling he might be staying..."